The Sunshine State, a new twin-screw tug designed by S.L. Petchull, Inc. of Fort Lauderdale, Fla., was recently delivered to Great Lakes Dredge & Dock Company by the builder, N.E. Insley, Inc. of Crisfie'ld, Md. Built to American Bureau of Shipping standards, the new tug, with dimensions of 46 feet by 16 feet and a 5-foot draft, has been placed in operation as a dredge tender on the Florida Coast. The Sunshine State's ample 'beam and deep V hull configuration will provide increased stability in rough seas. The hull, framed on 18-inch centers, is heavily built using J^-inch plate for the sheer strake and 5/16-inch for sides and bottom. There are four transverse bulkheads and four fuel tanks with a total capacity of 2,800 gallons. Twin Detroit Diesel Model 6-71 engines with 3.85 to 1 reduction gear turn 44-inch-diameter stainless steel propellers. Free speeds in excess of 11 knots were recorded during trial runs. The Sunshine State is equipped with hydraulic steering, two 3.5-kw diesel generators, air starting for main engines, keel cooling, radar, radiotelephone, monitor receiver, depth finder, and both hand and electric bilge pumps. The tugs forecastle offers full-day boat accommodations and seats six men. The pilothouse is large with good visibility. A fulllength bunk/seat provides additional seating required during crew deployment. The Insley shipyard is presently engaged in the construction of a 1,200-hp towboat, as well as the repair and construction of various smaller steel vessels. Additional information may be obtained 'by writing Jack Hoyle, N.E. 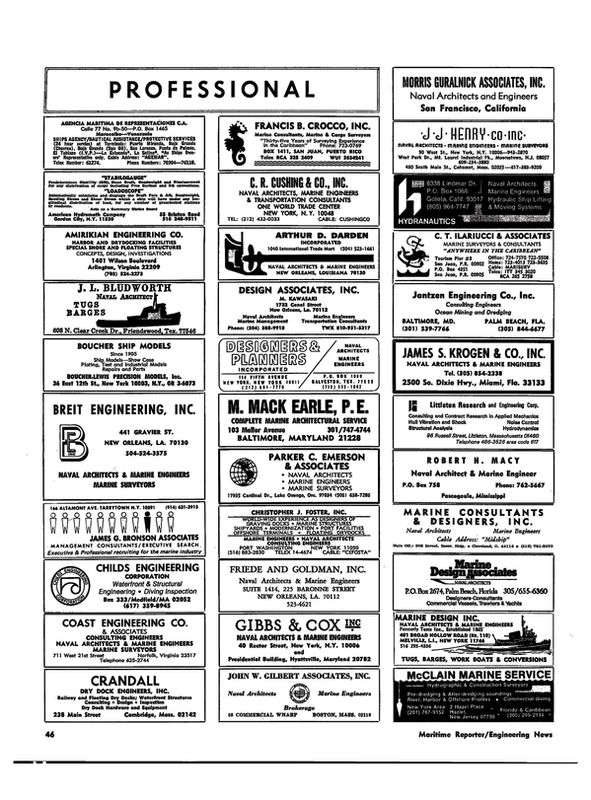 Insley, Inc., P.O. Box II, Crisfield, Md, 21817.